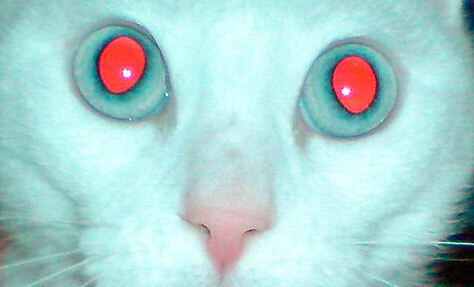 The red-eye effect is connected with the physiology of human eyes. It is caused by reflection of the flashlight (as a rule, built-in) from the man’s eye grounds, and accordingly, it appears only when the flash was used. One has to note right away that special measures for suppression of the mentioned effect in compact cameras of any producer-firms do not guarantee 100% success. A lot depends on specific conditions of shooting, color of human eyes (the lighter the eyes are, the higher the probability of red-eye effect is), on the method to suppress this effect. None of the methods is preferable, and guarantees the result. uses a special lamp. It turns on before activation of the shutter, and causes the reflex pupil of the eye constriction (narrowing). This method is goods due to its simplicity, economy for the batteries and that fact that it irritates the least of all: children are not distracted and do not blink. Pentax as a rule, uses rather powerful single pre-flash – this is more efficient, but more annoying. Olympus has the most impressive system: before taking pictures the flash radiates a series of 5 to 20 low-capacity flashes. This method is effective and spectacular, but its drawbacks are the same as its advantages. Your child will not look at rather bright and irritating color for about a second. Minolta system is very similar to the Olympus system, but it has fewer pre-flashes, they go one after another at a greater interval and are of higher capacity. A lamp is used in the simplest cameras. All the rest of the systems are very much alike and are variations of the above-mentioned.